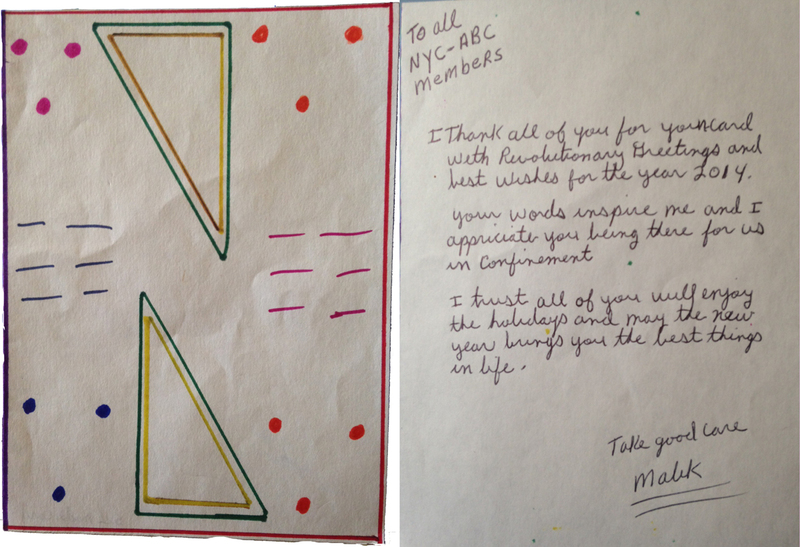 We recently received a great handmade card from Earth Liberation Front prisoner Marie Mason. Toward the end of her note, she thanks us for our patience in maintaining correspondence. The thanks is likely due to the persistent problem Marie has with receiving and sending mail. Though ostensibly held in a Federal Medical Center (FMC), Marie is actually in a restrictive unit within the FMC that greatly limits her communication with the outside world. You can support Marie by joining the campaign to move her from FMC Carswell to a prison where she can be in general population. Check movemarie.com for details. Hope this simple ‘hello’ and ‘thank you’ gets to you ok (maybe post cards are better, maybe not). Thanks you so much for your support and well wishes. I was glad to get the newsletter last week, to be inspired and informed by Mumia is always a gift. Your project means so much to me and so many others— and I especially want to thank you for your patience in keeping in touch. Stay strong, be well, until all are free!